Sometimes the trail less traveled isn't even a trail. For nine days we traveled a trail-free section of the Sierra High Route, a cross-country course that meanders along excitingly wild high-elevation subalpine country in California's southern Sierra Nevada range. 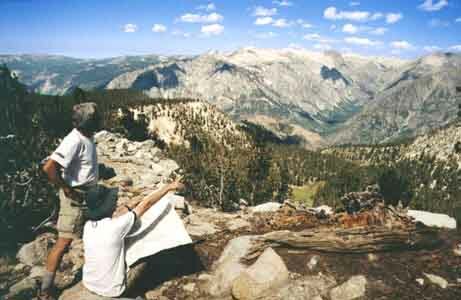 The route's southern terminus is Kings Canyon National Park and its northern end is Tuolumne Meadows, 195 miles distant in Yosemite National Park. to catch and eat deliciously tasty trout; marvel at magnificent views from remote vistas; and savor some of the Monarch Divide region's dazzlingly azure backcountry lakes. Trails crisscross the region that we traveled, but our goal was the loosely defined High Route, which traverses timberline country at elevations between 9,000 and 11,500 feet. Three of us  Tom Klump, Steve Underwood and I  began in mid-afternoon from Cedar Grove in Kings Canyon, an elevation of 5,050 feet. Lugging packs with enough food and supplies for eight nights, we followed the well-maintained Cooper Creek Trail past large yellow-bellied pines and mammoth cedars for 4-1/2 miles to our first night's camp at Lower Tent Meadows at 7,800 feet. It wasn't until the next morning, at a 10,325-foot saddle, that we left the traveled trail and struck out into a lodgepole pine forest, eventually contouring our way to a water-filled cirque known as Grouse Lake. We had planned to push further, but the lake's tranquil beauty seduced us to stay here for the night. This wasn't a forced march, but an exploration. Sleeping outside that night, Steve and I were mesmerized by a laser-like light show of flashing meteors. One unique shooting star moved east to west in the otherwise blackened sky. Instead of streaking in a straight line, it lazily undulated. Others meteors left brief tracers of brilliant light. In the morning, light ice covered our sleeping bags and left the water in Steve's water container frozen. The next morning we hoofed up 11,050-foot Grouse Lake Pass, where the reward included a 360-degree view of towering granite peaks. 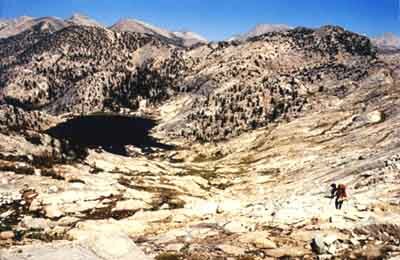 We dropped two miles down platforms of granite slabs to the highest of four Granite Lakes. Set in a cupola and surrounded by spiring peaks and weathered, twisted whitebark pines, the upper lake is one of the most idyllic I've seen. I spent the afternoon swimming, washing clothes from a bucket of lake water and reading from a grassy bench with my feet in the sand. Again, there was no reason to hike further. We were here today. Tomorrow we'd be there  wherever it is. 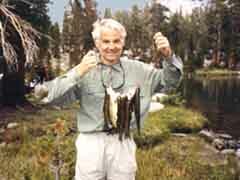 "Wherever" proved to be one of the several Horseshoe Lakes, where the attractions were lure-hungry rainbow and hybrid trout. Steve took two casts and pulled in two keepers. My first came on the third cast. We soon had enough for dinner. After our ritual "happy hour" I fried them over my stove in remnants of oil culled from a can of neatly packed caper-filled anchovies. Foods we never eat at home  canned sardines and smoked oysters  were treats we devoured in camp. The day's hike had featured an anxious scramble down a 300-foot step drop that, seen from the bottom, looked like a dried-out waterfall. After traipsing alongside meadows, the route joined a signed trail which we promptly lost. 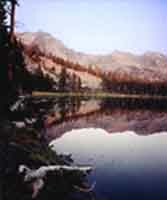 We found our way to State Lake, where we met a wilderness ranger who recommended this lake with the ravenous trout. The following morning we angled off the trail to White Pass, where we climbed a ridge with increasingly panoramic views of row-upon-row of spired granite peaks and river-gouged canyons. We crossed Windy Ridge and weaved a steep descent to a beautiful pond, then crossed a saddle, descended a steep gully, lunched by soothing pools, then stepped our way back up Red Pass. "The country continues to be incredibly and dramatically beautiful in a very rugged, raw sense. The canyons are huge gashes, the mountains sharp-sided slabs of violated, fractured rock," reads the journal entry I scribbled that night from a perch by a clear-beyond-belief lake that fills a granite basin at about 11,000 feet. To the north were a series of peaks, as irregular as ragged teeth. The sunset revealed layers of successive mountains that merged into a single mass in the morning light. "This is probably the most remote location I've spent time at," reads my journal. "It's a day's walk to a trail, and then another long day's hike out in any direction ... bare, vacant, but full of another kind of life and energy. During the night we listened to the sounds of wind, marmots, squirrels, birds and silence." More sights left us bewitched in the days that followed. Other fish were eaten fresh; others cleaned, packed in ice and later grilled. Sunsets colored the skies in shimmering soft lavender hues. 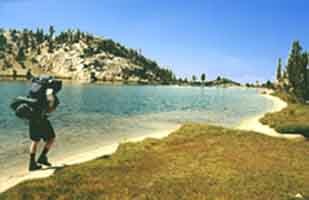 We lounged at pastoral ponds and camped at an expansive lake specked with granite islands. Breezes carried flavors of mint, manzanita and pine. Once, while waiting for Tom and Steve, I sat motionless as a deer promenaded into a meadow, then padded through the densely flowered field, nibbling the grass. The hike back to Cedar Grove included several miles on a well-built trail, including sections where crews laboriously created steps from enormous stones. But instead of gazing and pondering as we'd done on the High Route, we more purposely covered the miles on the highway-like trail. This route aimed through lower elevation, tree-bracketed forests. We already missed the high country's off-trail views. We thought back to Tom's exclamation, "This is fun!," when we had stopped for a water break while traversing the High Route. Fun it was. There's something exhilarating about relying on a map and compass. It's a sense of being alert and alive, of not simply following a well-traveled trail. 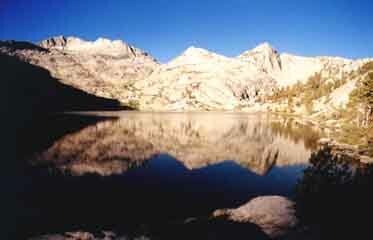 Click here for details to plan your own trip to the High Sierras.